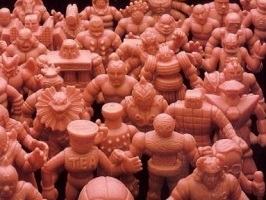 I’ve always thought that M.U.S.C.L.E. collectors should harness their collective power and do something productive for the greater community. Selecting a charity felt like it could be decisive or problematic with collectors wanting to support their preferred charity. However there seemed to be only one charity that all M.U.S.C.L.E. collectors could embrace – Toys for Tots. The toys from our collective childhoods had profound impacts for each collector. It would be wonderful if we could pass on that same joy. I wanted to post this campaign as soon as possible. Saving as little as $5 a week could result in each collector contributing, at least, $30. I will personally be collecting contributions through PayPal (DONATE HERE) and will submit a singular check to Toys for Tots. If a monetary contribution is impossible, or you feel uncomfortable sending money to me, then please drop-off any new, unused, and still packaged toys to any Toys for Tots drop site. This is the first attempt at coordinating something like this. Please be patient. I will continue to share information and the contribution total as they are received. If you have any questions, please do not hesitate to ask – either through comments below or through emailing the University of M.U.S.C.L.E.. This entry was posted on Tuesday, October 26th, 2010 and is filed under Sociology, UofM News. You can follow any responses to this entry through RSS 2.0. You can skip to the end and leave a response. Pinging is currently not allowed.